Mountain safety experts are urging visitors to Snowdonia not to get caught up in ‘summit fever’. The North Wales Mountainsafe partnership appealed to hillwalkers to remember the area’s mountains can be wild and inhospitable. Parents with children should remember that reaching the summit of Snowdonia’s mountains is optional and a bad experience can put young people off hillwalking for life. The Mountainsafe partnership, made up of North Wales Police, Snowdonia National Park Authority, the British Mountaineering Council, Mountain Leader Training Wales, the Met Office and Plas y Brenin, the National Mountain Centre, said the aim of mountain adventure is enjoyment. Easter is a popular time for young families to visit Snowdonia’s mountains and unfortunately some of these may need to call upon the services of local mountain rescue teams, it said. But at this time of year Snowdonia sees all extremes of the weather and recent days have proved no exception, with mountain temperatures plummeting from over 20C to below freezing within the space of a week. John Grisdale, chairman of Llanberis Mountain Rescue team said: “It’s important that children and young adults are given the chance to enjoy the mountains safely. “All too often I’ve heard anecdotes of children being taken to Snowdon’s summit in awful weather only to return stating that they never want to see another mountain again. Snowdonia national park warden Gruff Owen added: “A great challenge shouldn’t come at the sacrifice of enjoyment and safety. Snowdonia can provide a future lifetime of enjoyment for young children, or it can provide a few hours of misery. “Parents wishing to introduce their children to mountain walking should consider some of the many great walks in the area. 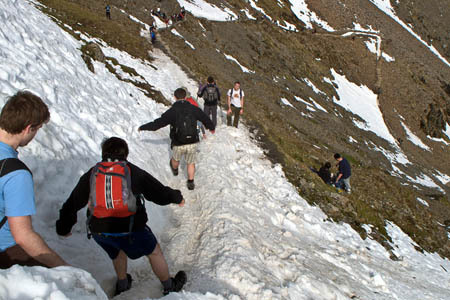 North Wales Mountainsafe said it was essential those who wish to venture to the mountain tops to follow safety guidelines and pay specific attention to the mountain weather forecast which can be found at on the Met Office website. Walkers can also follow on Twitter @safesnowdonia or @eryridiogel. For me. It is better to stay at home or spent the time together in a much more comfortable way. absolutely, you may drop that remote control and plate of chips on your foot and spend the day in A&E having xrays and a cast fitted.